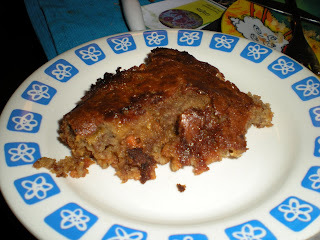 Each day, I check new recipes from blogs that I have been following for the past. I came across a top hit dessert recipe from Two Peas and Their Pod. It is easy and fast to prepare. This blog uses cinnamon chips, but I can't find them in large supermarket. As I understood, cinnamon chips are simply chocolate with cinnamon added. Montreal is known for some of its famous chocolate store, I'm pretty sure these chips can be find there. I substitued for butterscotch chips and it ended to be delicious. 1. Preheat oven at 375 F. Lightly oil a 8'' x 8'' baking pan. 2. In a medium bowl, mash bananas with a fork. Mix in eggs and vanilla. Using a spatula, stir in flour, baking soda, cinnamon powder and 1 cup sugar. 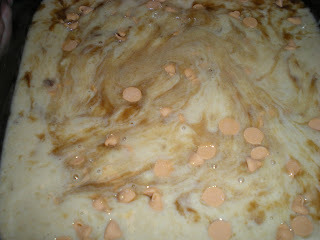 Add 3/4 cup cinnamon chips and briefly stir. 3. 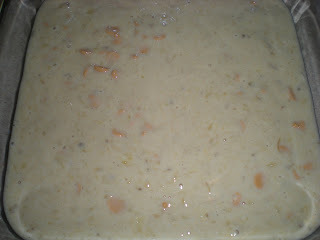 Pour batter into baking pan. 4. 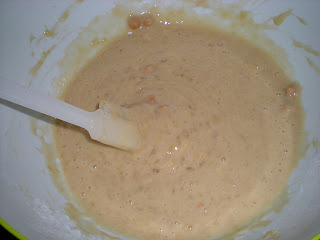 Add 4 tbsp sugar on top of the batter and gently spread it uniformly. Top it with the remaining 1/4 cup cinnamon chip. 5. Bake for 35-40 mins. Insert toothpick to check for doneness. Let it cool for 15 minutes. Add 4 tbsp sugar on top of the bottom and gently spread it uniformly. Top it with the remaining 1/3 cup cinnamon chip. What is meant by : "add sugar on top of the bottom"? Thanks for pointing it out, I meant batter not bottom.